Lawrence President Mark Burstein announces a partnership agreement with the UW Colleges that will make things easier for students from any of the state’s 13 two-year campuses to transfer to Lawrence and earn a bachelor’s degree. An historic partnership between the University of Wisconsin Colleges and Lawrence University will soon help students transfer more efficiently from the two-year institutions and earn a bachelor’s degree from Lawrence. 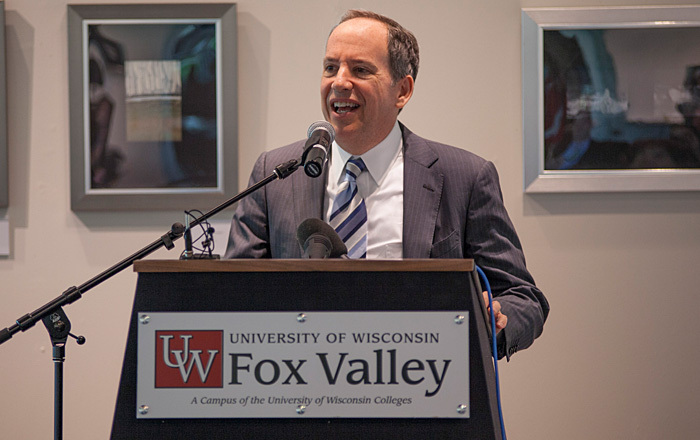 The partnership agreement was formally signed Wednesday (9/24) in ceremonies at the University of Wisconsin-Fox Valley. Lawrence President Mark Burstein, Provost and Dean of the Faculty David Burrows and Lawrence Special Assistant to the President and Professor of French and Milwaukee-Downer College and College Endowment Association Professor of Liberal Studies Eilene Hoft-March joined UW Colleges/UW-Extension Interim Chancellor Aaron Brower, UWFox CEO and Campus Dean Martin Rudd and UW Colleges Provost and Vice Chancellor Greg Lampe in the signing ceremony. The agreement is designed to minimize barriers faced by independent transfers from UW Colleges, including UWFox, and ease the transition process so students can reach their academic and career goals. Under terms of the agreement, Lawrence will provide specialized advising, registration, financial information and orientation opportunities for UW Colleges transfer students. Academic credits will still be transferred on a case-by-case basis. All UW College transfer students will be eligible for a merit-based scholarship up to $20,000 per year. Chuck Erickson, associate director of admissions at Lawrence, will serve as a transfer advisor and hold office hours every other week at UWFox during the academic year to meet with students interested in transferring. Lawrence currently has 10 students who have transferred from UW Colleges among its 1,500-member student body, including eight from UWFox. The majority of the transfers enroll at Lawrence after one year at one of the UW Colleges campuses. With the partnership agreement in place, Lawrence hopes to increase that number of transfer to between 10 and 15 per year. In addition to Menasha, UW Colleges have two-year campuses in Baraboo, Fond du Lac, Janesville, Manitowoc, Marinette, Marshfield, Rice Lake, Richland Center, Sheboygan, Waukesha, Wausau and West Bend.